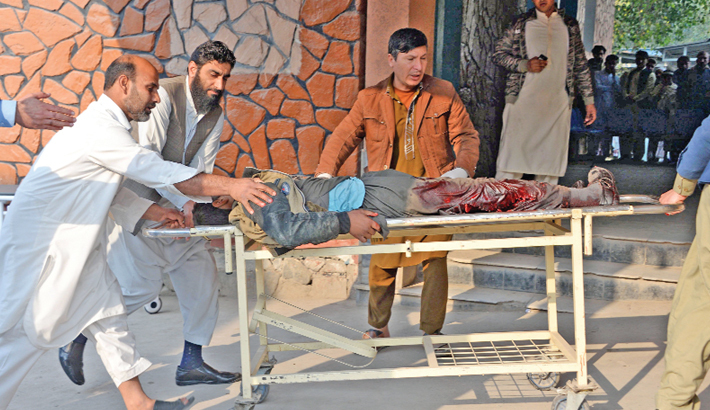 JALALABAD: At least six people were killed when a suicide bomber drove a motorcycle into a crowd at a political rally in the eastern Afghan city of Jalalabad on Sunday, police said, reports AFP. The crowd had gathered in a sports stadium for a demonstration in support for President Ashraf Ghani, said Nangarhar province’s police spokesman Hazrat Hussain Mashriqiwal. “Six people including a woman and a child have been killed and 13 more injured, all of them civilians,” he told AFP by phone. There was no immediate claim of responsibility for the attack, but Nangarhar province is considered a hotbed for the Islamic State (IS) group, which emerged in Afghanistan in late 2015. The Taliban also have an active presence in parts of the province. Afghan and US officials have stepped up their attacks on IS, saying the group was steadily losing territory with fighters largely confined to two or three districts in Nangarhar compared to around nine in January. But the group has also intensified attacks across the country, particularly in the east and in the capital Kabul, recruiting followers and in some places challenging the Taliban on their own turf. Last month a suicide attack claimed by IS militants hit a political gathering in Kabul, killing 14 people. Political rivalries have also been intensifying in the country before next year’s long-delayed district and parliamentary elections, which would pave the way for a 2019 presidential ballot.